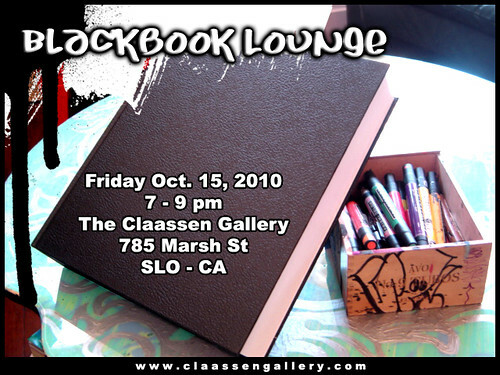 New Event At The Claassen Gallery: Blackbook Lounge! If you’re anything like us, you sometimes get stuck in a rut artistically. You procrastinate, life gets in the way, and before you know it you haven’t produced anything creative in months. Art is the lifeblood of creative people, without it we might become grouchy, depressed or just plain irritable, and that’s no fun for anyone. Well, guess what? We’ve got the cure. Artists of all ages are welcome to join us from 7-9pm. Bring your favorite sketchbook, a pocket-full of markers, pencils, pens, charcoal…. whatever gets you dirty. We’ll provide the music, friends, creative energy and inspirational environment. Pull up a chair, plop down on a bench, or set up shop on the floor- it’s all about having fun and making art! This is so cool! I love your gallery and art.